We believe that the independent services listed and linked to from this web-site by the mentioned companies to be as described but can take no responsibility for their quality. Surveys tell us that 6 out of 10 people haven’t made a Will. This may be because people can believe that if they are married, in a civil partnership or have a partner, then their “other half” will automatically get everything when they die. Unfortunately this may not be the case. Making a Will is extremely important and is the only way that you can stipulate who gets what after your death. Equally, making A Will can ensure that any dependent children you leave behind are looked after by people you nominate and can live where you choose. Memoria have identified the Legacy Alliance – a service which can offer a comprehensive professional Will drafting service to Memoria clients and their families, carried out by post email and phone. At Loving Tribute we provide a range of bespoke funeral stationery, personalised by you, to create a beautiful and fitting tribute to your loved one. We believe an Order of Service is not just to detail the running order of a funeral, but that it pays lasting tribute to your loved one, reflecting their personality, hopes and dreams. Our service allows you and your family to create your order online, or for one of our design team to create it for you. At Loving Tribute we work with you to ensure you receive the highest standard of care and attention you and your loved one deserves, providing the perfect keepsake for you to treasure. For full details of all we offer please visit www.lovingtribute.co.uk. The most inspiring range of Funeral Stationery templates available in the UK – making this the perfect way for you to create your own Funeral Stationery in memory of someone dear. Next Working Day Delivery – Place your Funeral Stationery Order before 12 noon, on any working week day and we’ll print & ship that day – FREE of charge. Add Your Own Wording & Pictures Using Our Simple Online Editor to create a wonderful tribute to a loved one – just the way you want it. There’s no need to worry about what goes where because we’ve pre-populated our templates with sample wording to help guide you every step of the way. 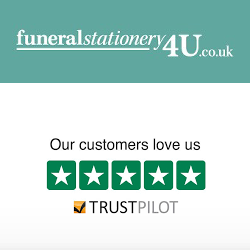 Please visit our website: funeralstationery4u.co.uk. We make memories last forever. A Professional film company brought to your door, creating beautiful presentations for you and your loved ones. Our creative service offers something special, giving those precious to you a keepsake, one to cherish forever. We will record your special keepsake with our own unique and sensitive approach, capturing the love contained within, allowing you to give something extra special to those closest to you. Time is precious, so spend it making beautiful memories, and pass those memories on; Keepsake Media… We make memories last forever. The tradition of releasing white doves has been used throughout history. White doves are the universal symbol of Peace, Love, Unity and Hope. Our doves come presented in heart shaped baskets, and we offer a free ribbon decoration as part of the price. Angel Wings offers a variety of options for the display of our beautiful white doves. We will work with you to make your event unique to you. Our doves are highly trained and will fly back home to our specially designed dove loft where they live and raise their own families. Memoria operates 1 hour time slots in order that a family and friends may have the facility to themselves during the course of a service. Therefore, we ask attendees of following the service to respect that family’s privacy and not enter the site until 10 minutes before the time of the service that they wish to attend. However, we do appreciate that some mourners will have travelled a distance and may be early as a result of wanting to be on time. Therefore, we have listed locations offering refreshments close by. For details please see below. This 21-bedroom hotel offers a cosy place to stay, traditional country bar, 70 seater restaurant and a star cloth marquee available to hire from April to October. The Airman Hotel is the perfect place to stay, eat and drink. Non-residents and families welcome. A grade 2 listed building with a fascinating history, situated in a quiet Letchworth road. Meeting and function venue which also provides rooms and catering for post-funeral receptions. Traditional village pub. Situated away from the main road offering a warm and friendly atmosphere. Traditional Real Ale. (Served continuously since 1778).